What are we talking about? It's clear that everyone is already bored of good fights, especially against the background of the fact that WAL disintegrates, and everyone yearns to understand who is the strongest. Who can we see on Vendetta All Stars - Armfight # 48 this year during the World Cup among the pros - Zloty Tur World Cup 2017? Oh, what a pity that we can not take all those who want pull at the same time... Here, Denis Tsyplenkov and Devon Larratt on the right hand, and Oleg Zhokh with the same Larratt on the left hand, Andrey Pushkar on the right hand with Michael Todd, Dave Chaffee with Dmitry Trubin on right hands, Sasho Andreev with Rustam Babaev or Khadzhimurat Zoloyev... Tim Bresnan with Gennadi Kvikvinia ... The list can be continued indefinitely, but behind all this, there are a lot of money. It is about spectacle, but we should collect money now. And not only our organization, but also the audience too. Let everyone write anything, but it's impossible to show such a gift for nothing. Calculate yourself how much it will take. In return, we guarantee a spectacle that has never been, and it is unlikely that anything like this will be organized without our participation. We will prioritize. As an organizer, I can count the minimum of 8-10 armfights that the whole world is waiting for. Desire for desire, and we need to choose who will participate in a maximum of four fights in the fall. Naturally, everyone is waiting for Denis Tsyplenkov with Devon Larratt on right hands (although, frankly speaking, I would have looked at the left hands too). Devon told me that this year he would definitely take part at the Zloty Tur or the armfights organized by us in Poland. All is well, we call Denis ... And he had a problem. A few weeks ago, Denis was hospitalized because of a bursting vessel in the bladder. He had to immediately put off the iron and start the treatment. According to the words, Denis will make every effort to recover, and in the near future begin to prepare for the fight. The desire is, so – nothing is lost. Given the fact that Devon had / has (I do not know for sure) a contract with WAL, it would have been difficult to organize anything without the consent of this organization. But there an opportunity to see Devon again in our organization. Oleg Zhokh - a guy who feels offended after losing in 2013 is ready to fight with Larratt on their left hands. 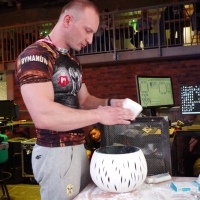 If the one who knows what Oleg was in 2013, and compare it with the current form, will understand that at least 90% of arm wrestling lovers are waiting for such a fight. Interesting, and, perhaps, in demand will be Dmitry Trubin's fight with Dave Chaffee on right hands. These athletes have never met in this format of struggle, and judging by the latest photos of Dmitry, it would undoubtedly be interesting to see their fight. Sasho Andreev has every chance to fight against such titans as Rustam Babayev or Khadzhimurat Zoloev. At the last European Championships, Sasho showed a good result by winning against Yevgeny Prudnik, but never met with Rustam or Khadzhimurat. At the same time for their two, there is a surprise from Italy - Ermes Gasparini! At the last Zloty Tur, Ermes showed incredible opportunities and probably would have been ready to fight one of the favorites of the weight class up to 95 kg. It is even difficult to judge who of the four (Zoloyev, Babayev, Gasparini or Andreev) is the favorite for the world champion in the 95 kg weight class. Remains Tim Bresnan and Genadi Kvikvinia. This duel though and in doubt, but it is interesting to see who is stronger. And what an armfight can be without Pushkar? Exactly one year ago Andrey Pushkar became the world champion on the right hand after Vendetta All Stars - Armfight # 46. What happened next at the World Cup in Poland was not so important. The title and the championship belt remain in Andrey's hands. And in the battle for the title of the best, no one like Michael Todd, who wants to fight with Andrey. We all remember 2012, when Andrey lost to Todd, but that was 5 years ago. The battle between these athletes remains relevant today. The only question is that Michael wants to fight for the world title, but at the same time he lost to Trubin and Tsyplenkov last year. How to be? The decision has not yet been made, but in the near future we will need to accept it - who will pull on the Vendetta All Stars - Armfight # 48? P.S. Last year we practiced shows of our tournaments in sports bars, specially equipped with TVs and large screens for viewing similar events. All this thanks to the "pioneer" from Moscow - Vasily Sorokin. Vasily gathered all comers in the sports bar and those who did not have the opportunity to come to the tournament in Poland, with interest were rooting for their favorites from the capital of Russia. Considering that it becomes fashionable to watch sports events with friends, we recommend taking over the experience and doing the same in your own regions. If you want to do this - contact us, we will help.